Ox: I've been practising that at Melwood! Hard work at Melwood was behind Alex Oxlade-Chamberlain’s ferocious long-range goal against Manchester City. Liverpool’s No.21 hammered a 25-yard drive into the top corner of the Kop-end net to put the home team 2-0 up after just 20 minutes of Wednesday’s Champions League quarter-final first leg. Sadio Mane then quickly added a third as the Reds, roared on by the deafening Anfield faithful, earned a deserved three-goal lead to take into next Tuesday’s return fixture at Etihad Stadium. Oxlade-Chamberlain, of course, also beat City goalkeeper Ederson from distance in Liverpool’s 4-3 victory over Pep Guardiola’s side in January. And the midfielder explained that he has been practising his shooting in training. 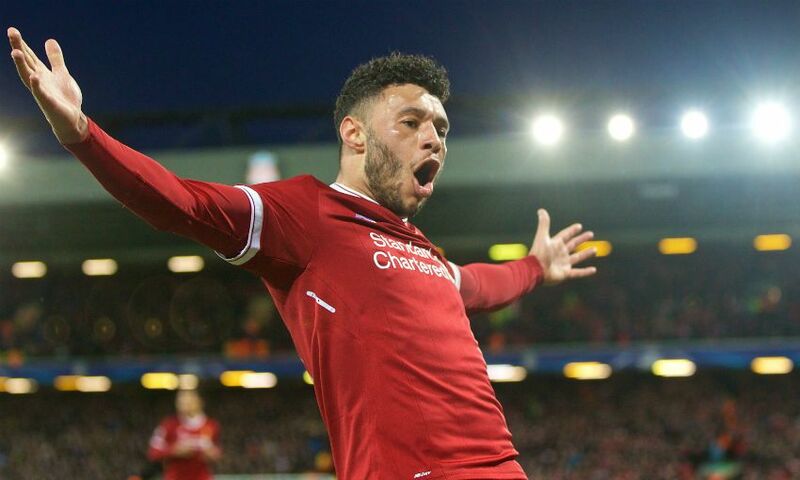 “Probably, but it’s not gone in too often!” Oxlade-Chamberlain told BT Sport, after being asked if he’d ever struck a sweeter shot than his goal on Wednesday. Reflecting on Liverpool’s rampant first-half performance, which saw just 18 minutes separate Mohamed Salah’s opener and Mane’s goal, the England international said the partisan atmosphere and an eagerness to fly out of the traps were key. “Obviously it was a great start for us and going 3-0 up before half-time set us up brilliantly,” he stated. “We knew we had to start fast and I don’t think that was hard today with the crowd, the atmosphere. Even through the warm-up, the fans were unbelievable out there. The Reds’ next assignment comes in just three days, when they make the short trip to Goodison Park to contest the third Merseyside derby of the season. Oxlade-Chamberlain continued: “We enjoy this tonight and then we start again tomorrow. “It’s another massive game. The derby is up there with the biggest game of the season and we know that.